Looking for a fun way to practise your listening skills? Why not come along to our monthly movie night, held at the school on the last Thursday of the month from 18h30 – 20h00. Each month we will choose an interesting film based on the genres and themes of your choice. Not only is it a great way to relax and meet new people but you will also be improving your listening comprehension and widening your vocabulary. We will do our best to find films with English subtitles for those who need a little extra help. 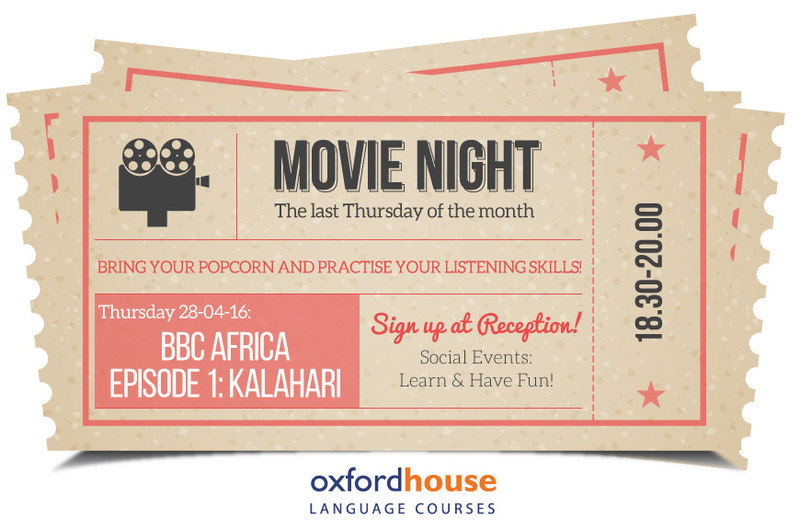 This month’s movie, on Thursday 28th April, will be the thought provoking BBC documentary ‘Episode 1: Kalahari’. After the movie, feel free to join Oxford House teacher, Olivia at Speaking club (at Bar Zafra) to discuss the film. She will meet anyone that wants to go at reception at 20h00. Movie night is free to all our students. Limited spaces available so sign up asap to avoid missing out. Don’t forget to bring your popcorn!